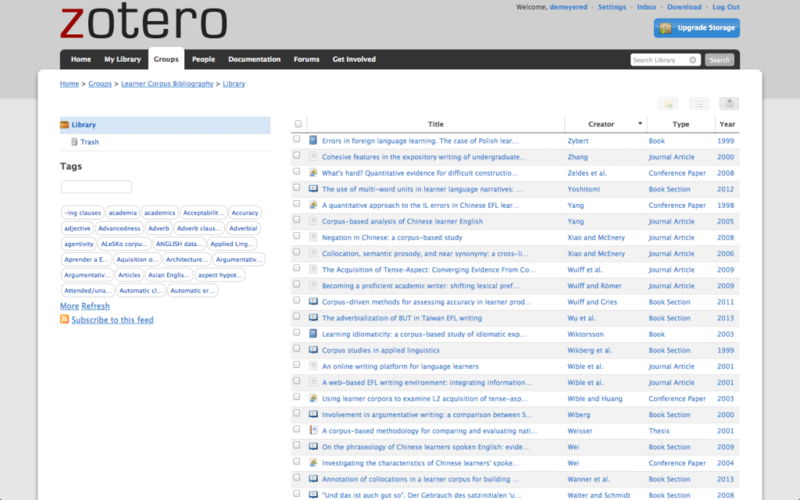 The Learner Corpus Bibliography is a Zotero collection of bibliographical references related to learner corpus research. The LCB was created and maintained by the Centre for English Corpus Linguistics (director: Prof. S. Granger) until September 2013. In its current state, the LCB totals c. 1,100 references but it is updated on a regular basis. It is fully searchable by fields like author, title or publication year, as well as by keywords and languages (L1/L2). Electronic versions of draft articles (or links to webpages) are also provided whenever they are available. The CECL agreed to share the LCB resource with the Learner Corpus Association. The LCB will still be available on the CECL’s Learner Corpus Bibliography webpage but in the form of a static list of references.